Look! Knitting! 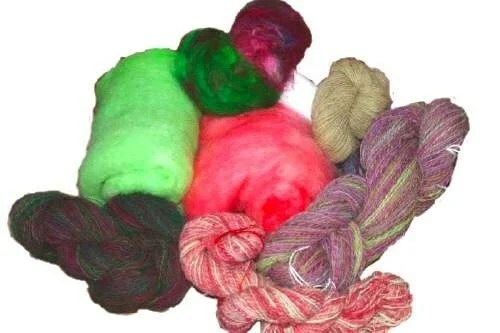 And technically spinning and dyeing as well, since I never got around to posting this yarn when it was still just yarn. I’ve been fascinated with the sky for quite a while now, I keep taking pictures of it, which alas are never as cool as the sky itself. This yarn is my first (I know there will be more) impressionistic attempt to capture some of the cool things the sky does out here. I did actually manage my May TIF project, but inexplicably my computer ate the pictures. It was quite the disaster actually, about 50 shots just turned into absolute rubbish. I had adorable pictures of FreeBunny#1 playing around by the pond, pictures of Phil with the punk-rock hair he gets after he has been diving around in said pond for a while (black and spiky with yellow tips, I want my hair to look like a wet baby goose!) and some actual proof that I do occasionally get something done around here. All gone. Remember when this was predominantly a fibre blog, and not the farm-blog of a chick who knits occasionally? Me too. It’s ok, the fence is finally finished (hip hip hooray!) and as soon as the sheep finish trying to figure out how they can get around it (so far they are full of fail, but give ’em a week or two) and accept that they freaking well live here, maybe I can get up to the studio again. The only thing I’ve been doing up there lately is making a white linen altar-cloth, which as you can imagine doesn’t photograph interestingly. As you can see, it still needs some work. I love it, though. Here, look at a pretty flower instead. This iris is saying, “I don’t care if I’ve been eaten repeatedly by sheep, and was dug up and moved just last week, I’m going to bloom anyway, dammit!” You go, little flower. Here’s Raven’s garden in front of the funny looking house. It’s super pretty and full of huge irises (which don’t scare me), and it distracts people from noticing that the house is still on the dowdy end of the scale. I know that it works, because sometimes our neighbors stop their trucks and say “wow, your garden is looking so pretty, it’s really coming along!” and so far no one has also said “did you know the front of your house is sliding off?” or “where exactly did that piece of roof go?” They do sometimes say, “you should sell tickets to this place”, but I think they mean it kindly. This morning I woke up at five because a flock of geese flew past, and woke Phil up! He cheeped at their honking – maybe all of our telling him that he is a goose and that his cousins all live down by the lake is finally sinking in! 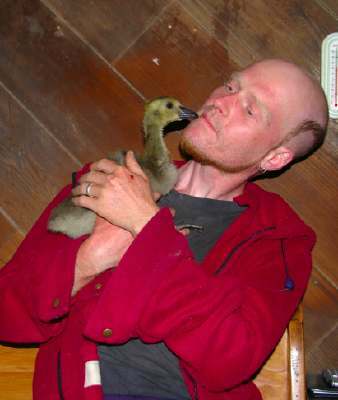 It’s actually kind of nice waking up with a snuggly downy goose – he sits kind of on my shoulder and snuggles up to my neck. For those of you whose minds go directly to the more unpleasant aspects of cuddling wild birds, there are thank mercy no bugs, and well yes, I’ve been doing an awful lot of laundry. But really, it’s sweet. He’s all soft and chirpy. We hope he acquires a youthful spirit of independence very soon, before he weighs fifteen pounds and has big poky feathers. His feathers are just starting to come in – you can’t see them yet, but if you rub his back and tail you can feel the quills. Look how big he’s getting! This is three weeks old. As you can see, he’s still Daddy’s little sweetheart. Raven hand-selects clover and maple keys for him to eat, and hand-feeds him dandelions. I can’t imagine how this will help him acquire that youthful independence I’m dreaming about. Me, I just wander around doing what I’m doing, and let him figure out where I am. If he cries I will call him to me – he knows his name – and assure him that he’s not being abandoned, but for the rest of it, it’s his job to know where mommy is, and if he wants to wander off and eat grass “over there”, well good. Mostly he sticks pretty close, and in the mornings he can cheat, because he knows my routine (chicken coop #2, chicken coop #1, barn, house again) and so can meet up with me anywhere en route and not have to worry about being trampled by hungry barn fowl.